If you had a sense that the green economy was going gangbusters you’d be right. Victoria leads the pack and Australia’s ahead globally. MARKET PULSE: Green job demand has increased by 50 per cent in the past two years, according to new data by jobs site Indeed, with Victoria now at the top of the pack. 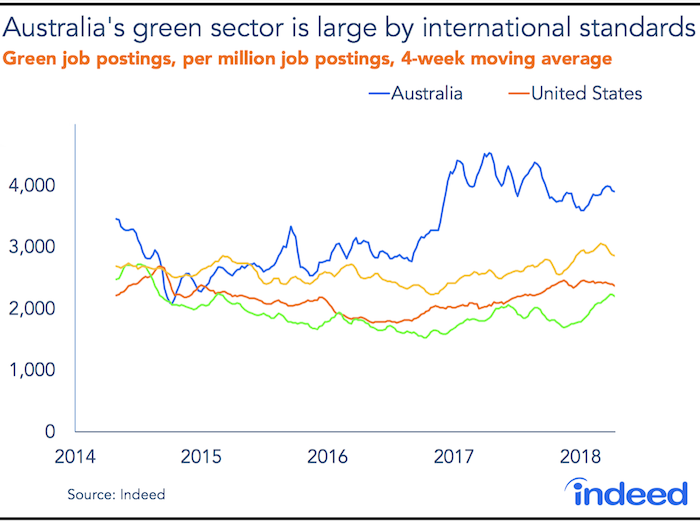 Economist Callam Pickering put together the data, finding that, despite uncertainty around energy and climate policy, demand for green jobs (as a proportion of total job advertisements) was on an upwards trajectory, with Australia ahead of the US, UK and Canada. “In the first quarter of 2018, Australia’s share of green jobs was 30 per cent higher than the United Kingdom’s, 60 per cent greater than that in the United States and 85 per cent higher than Canada’s,” Mr Pickering said. The data is supported by the latest Green Energy Markets index, which found that full-time renewables-related jobs had increased by about 18 per cent since late last year. The highest sought-after positions were environmental health officers, which we noted at the end of last year were in short supply. They accounted for almost one-third of total green jobs advertised, ahead of environmental managers at 18 per cent and environmental consultants at 10 per cent. 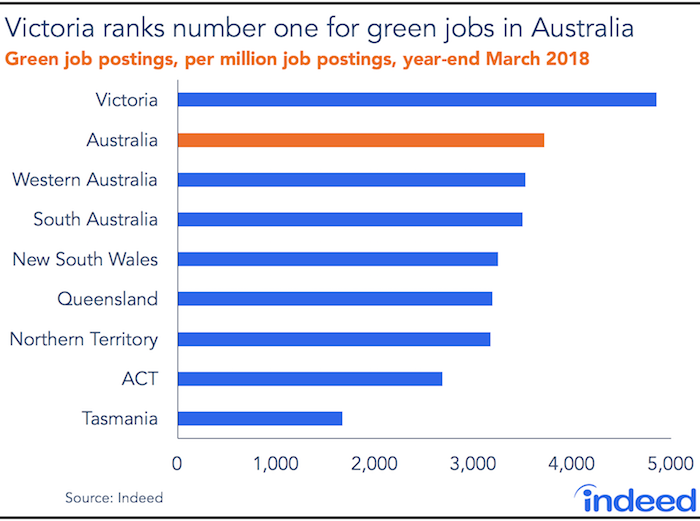 Victoria emerged as the state with the most demand for green jobs, with the only state to exceed the national average, followed by Western Australia and South Australia. “This is quite a leap,” Mr Pickering said. Ross Harding, who runs built environment sustainability consultancy Finding Infinity(and who also runs the Off the Grid Festival in Melbourne), says he thinks Victoria is the most progressive state in the country and Melbourne the most progressive city when it comes to sustainability. While he says the jobs data needs to taken with a grain of salt – as many of the jobs may be related to peripheral issues like health and safety, for example – he believes there is growing demand for sustainability, and it’s coming from the bottom-up, with consumers demanding it and businesses responding. In his business government policy hasn’t really had any cut-through, though. “It’s really business and consumers pushing the point,” and in Melbourne Harding was working with developers “trying to build better because they think it’s the right thing to do; they want to lead”. “What we do is focus only on absolutely pushing the limits. We don’t work on projects that do minimum compliance. And it’s been interesting. Two years ago, no one was really coming to us and we had to go and knock on people’s door. Now there’s more and more clients looking to go net positive and going beyond minimum compliance, and realising they need to offer this as a product. Pickering expects green job demand to continue its upwards trajectory, noting that global law firm Pinsent Masons found that Australia ranked fifth – behind Germany, China, the United Kingdom and India – as a target for global energy investment. Greening the West was established in 2011 by City West Water. This urban greening initiative in partnership with six local LGA’s and key agencies supporting green infrastructure projects to improve community health and liveability in Melbourne’s west. GTW ahead of its time and is a really great urban greening initiative!